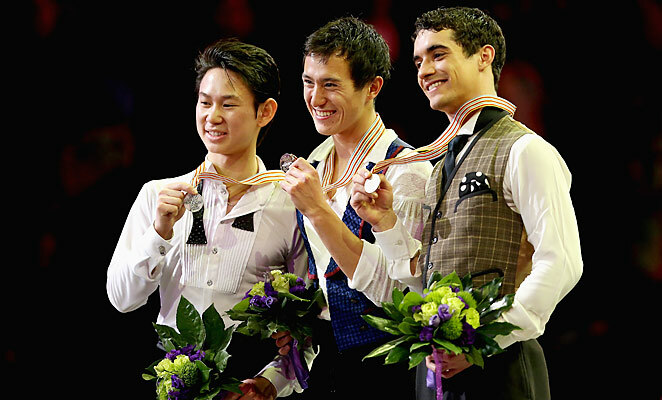 First of all I want to say Congratulations on your third World Championship title. This isn’t a letter to talk about “Chanflation” or other ridiculous things. It’s in fact to tell you, you deserve it! Yes, the LP may not have been your finest performance, but you would be the first to admit it. However, winning a championship is not only about two programs, it’s also about all of the components. And you are the complete package. Like the Canadian Champions before you, you show impeccable technique and strong performance qualities. But to me you combine these like none-other. You are effortlessly powerful AND graceful. You seamlessly meld footwork into jumps into choreography and back… you show strength not only in your skills but in your choreography… and yet demonstrate a sensitivity and gentleness that makes you endearing too. But this isn’t a letter to tell you things you already know. Or to boost your ego. I wanted to write to you because I saw some of the interviews you did before Worlds and well what I wanted to say is, I get it. I understand how at the peak of your game you begin to question what you’re doing, and what you want. How just a year out from the Olympics when things are going so well, for some reason there’s a change – and things aren’t flowing so smoothly. It happened to me too. I had come off of being the most medalled Canadian Athlete at the 1998 Commonwealth Games. Then a knee injury took me out for about six months. Undeterred, I returned to competition as if nothing had happened. But looking back at what followed, something was happening. In the 1999 Pan American Championships in Winnipeg a fluke mistake (nearly falling on my face out of a spin) placed me in 4th – and would eventually lead to me not making the 2000 Olympic Games. Perhaps it was the pressure of the hometown crowd? Perhaps it was the doubts that began to creep in? Perhaps it was as you experienced, that you just needed a change. I often think that being in sport one must utilize a kind of ‘auto-pilot’. This is important so that we don’t interfere with the knowledge and experience of our bodies. But sometimes when our training gets on auto-pilot we need to shake things up. I think your change in location is an excellent example of this. But I think something else needs to shift. In an interview you spoke about enjoying working hard – putting in time in the gym etc. But can you find the joy in your skating? Can you go back to the excitement of how the ice feels under your blades? The thrill of your feet moving blazing fast? Nailing your most complex jumps? The goosebumps when you live the music? Can you get out of your head and into your body. You don’t need to force yourself to be good. You are. You don’t need to try hard to be a champion. You deserve it. You have earned it, time and time again. Trust your training. Trust the years of work you’ve put in. And enjoy it. During my yoga teacher training Eoin Finn helped us realize we are at our best when we are being a CONDUIT. Perhaps you could try the same thing with your skating… allowing it to flow through you. I know, and I think you know in your heart of hearts that you have everything it takes to be Olympic Champion. Trust that knowledge, honour that faith. My coach said “you’re too smart for your own good” and I feel like you are as well. Allow yourself to be all that you are. Allow that journey to be filled with happiness and fun. Allow the ups and downs to happen, the good and the bad. And realize that they don’t need to affect you. You can choose to go with the good and release the ‘bad’. This entry was posted in Sport and tagged Figure skating, Inspiration, motivation, Olympics, Patrick Chan, Sport, World Champion by erika. Bookmark the permalink.